It’s that time of year again. Time for companies to get their Christmas cards designed, printed and ordered in time for the holidays. 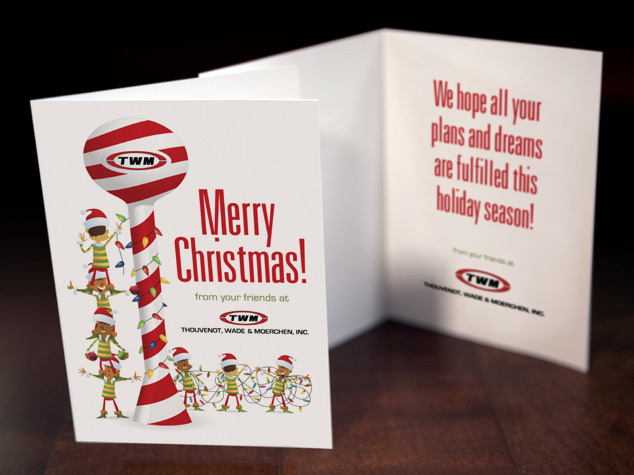 Once again Thouvenot, Wade & Moerchen (TWM) has contracted Visual Lure for a custom designed Christmas card. This year they wanted to incorporate a water tower into the design as every year they try to highlight one of their core services. One of their specialties is water and waste-water civil engineering which includes the design of water towers. This years card features a candy cane water tower being decorated by elves. We custom illustrated the water tower, and customized two sets of stock illustrated elves to make them look like they were wrapping the tower in lights. If you are interested in a custom design Christmas card give us a call and be sure to check out our other graphic design services.